Emerson, Lake And Palmer frontman Greg Lake’s memoir, “Lucky Man”, will be published posthumously this spring by the Little, Brown Book Group imprint Constable. Written in Lake's own words, the project will arrive just a few months after the musician passed away from cancer on December 7, 2016 at the age of 69. "I have been Greg's manager and close friend since 1972,” explains Stewart Young. “In 2014 Greg was diagnosed with terminal cancer. He told me he was going to write his autobiography and it had to be in his own words. He had no regrets. In his wildest dreams he could never imagine having such a wonderful life; how extraordinary to have such a career in music — to do what you want, simply to expand, experiment! “To love a woman, be married to her for 43 years, have a daughter he would be so proud of and then to cap it all a grandson who is now four years old and became the centre of his life. He then said, with a twinkle in his eye, I truly am a Lucky Man." "Greg finished writing his poignant memoir just before he died last month, and I'm very sorry he won't be here to see it published,” adds Constable Publishing Director Andreas Campomar. 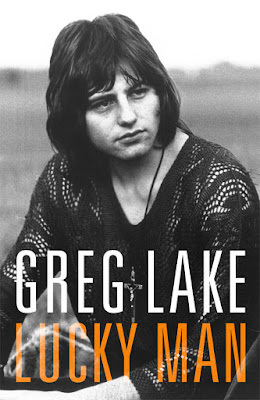 “Probably the voice of his generation, Greg fronted the greatest rock supergroup of the 1970s but never held with the 'progressive' tag that attached itself to both the music and the excess. “The memoir not only charts the highs and lows of a career in rock music but also reflects on the death of Keith Emerson last year and living with terminal cancer and the end of life. I think Greg can best be summed up by his now-famous line: 'Material wealth is a very fleeting pleasure … when you can buy anything you want and do anything you want, you soon discover that you actually don't want any of it.'" He formed the supergroup ELP with keyboardist Keith Emerson and drummer Carl Palmer in 1970, and the trio went on to sell more than 50 million albums worldwide.